Non- aggressive and non-competitive nature of Aikido can build self confidence and self esteem. Am I too old to learn Aikido? Everyone is expected to train at a level accessible to their partner. Learning how to receive technique is part of Aikido practice. You learn it and incorporate it at your own level and pace. More "athletic" or experienced training partners also benefit by using their time with you to improve the clarity and sensitivity of their skills. Aikido is inclusive by nature and that is reflected in the Aikido Orlando Dojo experience and community. 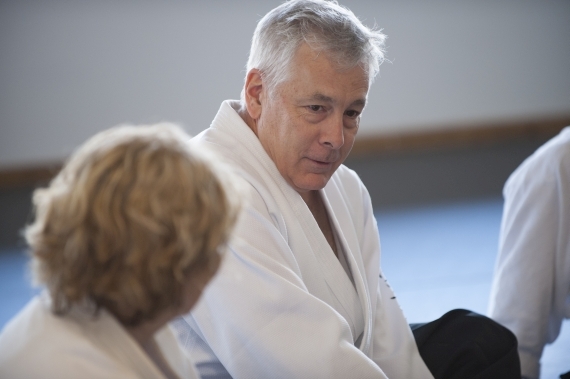 Our Low Impact Aikido classes are prepared for students with physical limitations. You can start with low impact and later, when your stamina and fitness level improve you can safely transition to regular classes or continue the Low Impact Aikido to study and practice Aikido without falls and rolls.